The most likely warranty repair would be bearings or windings, which are very rare. This type of failure is much less than 1%, and if it is going to happen at all, most likely would occur within the first 12 months. Failures after that are extremely rare. See MTBF above. The PHASE-A-MATIC™ failure rate is practically zero because the rotors are specifically designed and manufactured for rotary converter use. [see MTBF below] However, some of our competitors emphasize that rotors often fail. This is because they machine standard electric motors, modifying and thereby weakening standard electric motor rotors, which were not originally designed to be used as a phase converter. For use with Rotary Converter for 3-phase electronic equipment such as CNC/PLC machines, AC/DC drives, and all voltage-sensitive equipment. Provides +/- 5% voltage stabilization. The normal operating voltage of the Rotary Phase Converter is 208-230VAC. The output voltage of the Rotary Phase Converter is normally higher than the input voltage under no load and light load conditions. In applications with high single-phase voltage (greater than 230V), the no load or light load output voltage may be excessive. Some CNC/PLC equipment will not work properly at the higher output voltage. The Phase-A-Matic™ Voltage Stabilizer is designed to reduce this higher voltage to nearer the input voltage. It will also keep the output voltage stable during peak loads, thus helping CNC/PLC equipment and other voltage sensitive equipment to operate properly. Running very small motors alone on a Rotary Converter that is 3 times or more larger may not reduce the output voltage sufficiently, in which case the smaller motor may run hot. For these cases, to reduce cost it may be possible to use a dedicated Voltage Stabilizer sized to the requirements of the problem motor only. Consult factory. Supplied in a NEMA type 1 enclosure with various sizes of knockouts. Intended for indoor use only in dry locations, but can be placed in a rain tight enclosure for use in wet or damp locations. The Rotary Converter is designed to supply full running current to a three-phase motor normally providing it with full running torque. However, most motors will draw five times their running current during start-up. When used at its maximum HP rating the Rotary Converter cannot deliver the full (5 times) starting current to the motor and therefore cannot provide full starting torque. For heavy start-up loads a larger converter should be used. TYPE 1 LOAD- May be used up to the HP rating of the converter. * For instant reversing (as for rigid tapping), size according to TYPE 3 LOADS*Many restrictions apply. Most applications require sizing the converter a minimum of 50% larger (see all load types). Contact Phase-A-Matic, Inc. to verify load type. TYPE 2 LOAD- These include domestic & European lathes without a clutch, some pumps, wheel balancers, paper cutters, flywheel driven equipment, air conditioners, blowers, woodworking band saws, dough mixers, meat grinders, motors rated below 1000 RPM, etc. 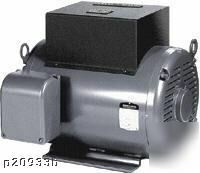 Use a converter with HP rating of at least 50% larger than HP of the motor. TYPE 3 LOAD- These include Design "E" motors, Taiwanese, Chinese, Brazilian, Mexican motors, pumps starting under load, etc. Use a converter with twice the HP rating of the motor. TYPE 4 LOAD- These include laundry extractors, hoists, elevators, etc. For these start-up loads use a converter with three times the HP rating of the motor. TYPE 5 LOAD- Often hydraulic pumps, which come under a momentary load during use will be loaded well beyond their rated HP for the brief period of maximum PSI. Examples includes bailers, compactors, paper cutters, shears, pumps, etc. The HP of the converter must be at least as high as the actual HP developed by the motor. To calculate the HP developed, you must first find the actual amperage drawn during maximum PSI. This is different from the rated amps of the motor. Next you would divide the maximum amperage by 2.8 to find the actual HP being developed by the motor. That figure is the minimum size of converter to be used. Example: A 10 HP compactor with a motor rated at 28 amps but draws a peak of 40 amps momentarily at maximum compression. Divide 40 by 2.8 = 14.3 HP being developed, use model R-15 Rotary Converter. In some applications it is possible for the Rotary Converter to run up to 3 times its rated HP provided the motors are not running heavily loaded. Always contact the factory for help before attempting to do this.